Baia Sportsfishing Lodge is located in West New Britain, Papua New Guinea and is home to world class Bass fishing and amazing ocean and river surrounded scenery. Our www.fishingcharterbase.com is an online fishing charter reservation website. Your fishing charter booking and contract is with Baia Sportsfishing Lodge and is secured with a deposit paid to them. However we understand that our customers may have general questions about fishing in PNG. A fishing charter like this one is a once in a lifetime experience and for that reason, we have paid special attention to providing you with the internets most comprehensive information on Baia Sportsfishing Lodge. This page is written by one of our staff members that recently fished at Baia Sportsfishing Lodge in PNG. Further information on fishing in PNG can be obtained by calling www.fishingcharterbase.com on +61 (0)401660745. Baia Sportfishing Lodge is located in West New Britain, Papua New Guinea (PNG). Technically the lodge is in West New Britain however a closer look at the map shows it is only kilometres from East New Britain. The closest major town to the northeast is Rabaul, and to the southwest is Kimbe (the base point for your fishing adventure). Baia Sportsfishing Lodge is owned and operated by Kimbe-based angler Riccard Reinmann. Riccard has achieved great success by developing a world-class and boutique recreational fishing operation while contributing to the local community through a range of projects. Riccard was educated in Australia and clearly understands the expectations of international recreational anglers. Your fishing charter commences with your pickup from Hoskins Airport near Kimbe in West New Britain, PNG (about a 1.5 hour flight from Port Moresbys Jacksons International Airport). The booking of all flights is your responsibility as they are not included in the fishing charter package. Flights from Sydney & Brisbane to Port Moresby can be booked online through Qantas (www.qantas.com.au) and their affiliate Air Nuigini (www.airnuigini.com.pg) or through Pacific Blue (www.pacificblue.com) or their affiliate Airlines PNG (www.airlinespng.com.pg). Both Air Nuigini and Airlines PNG operate flights to Kimbe from Port Moresby on a regular basis. The international and domestic airports in Port Moresby are located next to each other within under 5 minutes walk within the confines of the airport. Due to its location where rivers meet the ocean, Baia Sportsfishing Lodge provides a choice of both river and blue water angling. The ocean fronting Baia village and the region is home to a variety of tuna species including both yellowfin and skipjack tuna. Dolphin fish (mahi mahi), Spanish mackerel, barracouta, coral trout and all manner of reef fish are also common catches. The range of species on offer is extremely broad. The rivers surrounding Baia also house much more than PNG black and spot tail bass. These rivers regularly produce mangrove jack, trevally, sharks, tilapia (great live bait for PNG bass) and even the less popular catfish. The fishing guides at Baia Sportsfishing Lodge can provide you with fishing equipment suitable for both river and ocean fishing. However due to the remote nature of the lodge, it is recommended that you bring a good supply of your own lures, hooks, sinkers and spare line (including spare leader). For chasing the black and spot tail bass we recommend a bait caster outfit similar to the sort of barramundi outfit used on Australias impoundments. Our experience showed 30lb braid with 40-60lb leader on a one-piece Ian Miller rod with a Shimano Curado or Calcutta to be perfect. It is possible to chase PNG bass on lighter gear, however 30lb seems to be the most popular gauge. You may also wish to bring some 50lb and a heavier reel should you elect to chase bass using live bait. The strength and power of the PNG bass cannot be underestimated! When targeting the ocean species the standard overhead reel packed with 50lb line and a decent threadline rig for casting at schools of tuna is the perfect kit. 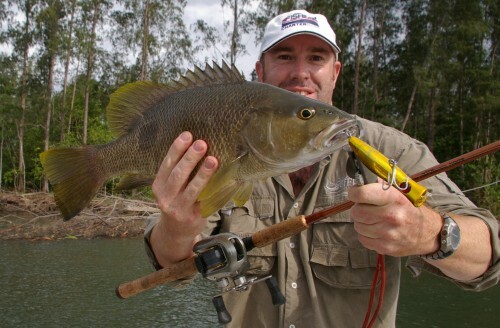 When chasing PNG bass, most barramundi lures seem to work and it is recommended that rusty or second-class trebles be replaced with sharp and strong alternatives, for example Owners trebles. We found the most popular and productive method of targeting both species of PNG bass was using surface poppers, skidder pops and even fizzers. Again, we recommend you take a variety of sizes and colours with gold working well at sunrise and sunset, and the fluorescent colour poppers more suited to the dirtier water. For chasing the ocean species, we recommend taking anything silver for casting, and a selection of hard body lures for trolling at speeds of up to 8kn for mackerel. It may also pay to pack some 60-80lb steel leaders. When packing for this charter, we also recommend you consider a range of soft plastic lures. Mangrove jack are abundant in the rivers of Baia (with many in the 5-8kg range) as are trevally with both well suited to soft plastics in the 65-110mm size range. Our staff had great success on Squidgy Drop Bears, particularly the 65mm size. The lodge itself is located on a small spit with views across the ocean, and access from the rear of the lodge where there is a small jetty at the mouth of a river. The lodge comfortably sleeps 12 people on a shared basis or less if individual/double rooms are sought. The highlight of the lodge is an open and comfortable dining/sitting area overlooking the ocean from the second storey. The local staff, many of who are employed from Baia village itself, prepare all meals. The range of food given the remoteness of the lodge, is incredible and of a high standard. Good use is made of fresh seafood that may include mackerel, tuna, coral trout, local clams, mangrove jack. Power at the lodge is via generator during the day, with room fans operating 24hrs through an inverter overnight. The rooms are equipped with Australian power points so camera batteries and other electronic items can be charged during the day. The lodge operates a well stocked bar with local PNG beer, a range of Australian wines, and half a dozen different spirits all available on a tab-based system. Bottled drinking water is also available for purchase and all fishing guides carry an adequate supply of free drinking water on board. The fishing vessels at Baia Sportsfishing Lodge are custom built to suit both river and blue water fishing. The vessels are fibreglass with ample casting and storage room. 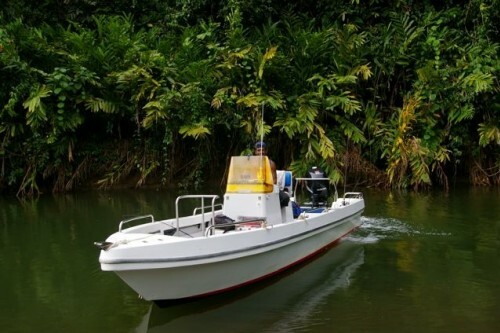 They are equipped with Suzuki 115hp 4-stroke outboards and side-console steering. All fishing guides at Baia Sportsfishing Lodge carry personal EPIRBS and all other safety equipment. While most people that visit Baia Sportsfishing Lodge do so as a fishing charter, the location of the lodge makes it perfect for a number of other activities. The guides at the lodge can arrange personal tours of the local Baia village, canoeing and snorkelling on reef rich waters in front of the lodge, and photographic tours beneath the still smouldering volcano called “The Father”. The lodge itself has plenty of space in which to just relax and read a book or listen to music. Snorkelling in front of the lodge is fantastic so take your own mask if you prefer not to use borrowed equipment (available from the lodge). If you like sashimi take a tube of wasabi sauce and some small packets of soy sauce in your tackle bag as there are plenty of tuna outside the lodge. Think about taking a waterproof bag or container to secure your camera, phone, ipod or other valuable in case of rain when fishing. Before the trip, practice casting a bait caster long distances as the fishing guides at Baia Sportsfishing Lodge recommend long casts when chasing PNG bass. While it pays to buy some local PNG currency before arriving in PNG (called PNG Kina), obtain most of your PNG Kina at the currency exchange within the international airport as you will get a much better rate in-country. 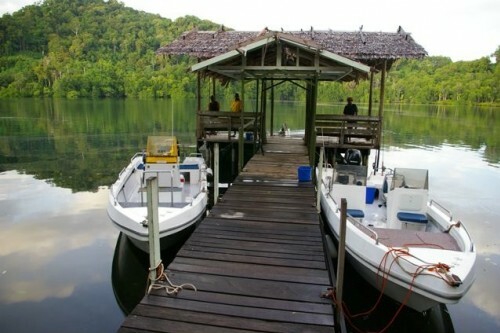 Company Located in West New Britain, Baia Sportsfishing Lodge is owned and operated by recreational angler and experienced tourism operator, Riccard Reinmann. 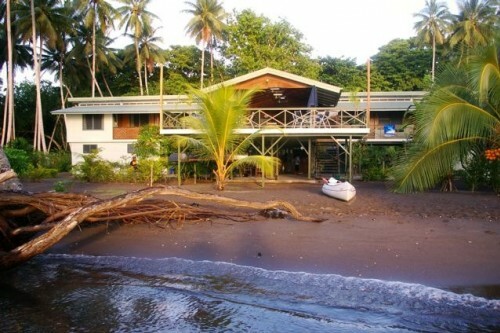 The lodge itself is located next to Baia village not far from the border between PNGs West and East New Britain. Baia Sportsfishing Lodge offers a variety of angling and other adventure activities including estuary and river mouth fishing for Black Bass and Spot Tail Bass, deep sea fishing and snorkeling on a variety of pristine reefs. Baia Sportsfishing Lodge is dedicated to making your PNG angling and cultural experience a once in a lifetime adventure.